All the trades opened in March are finally closed and a new month is already underway. 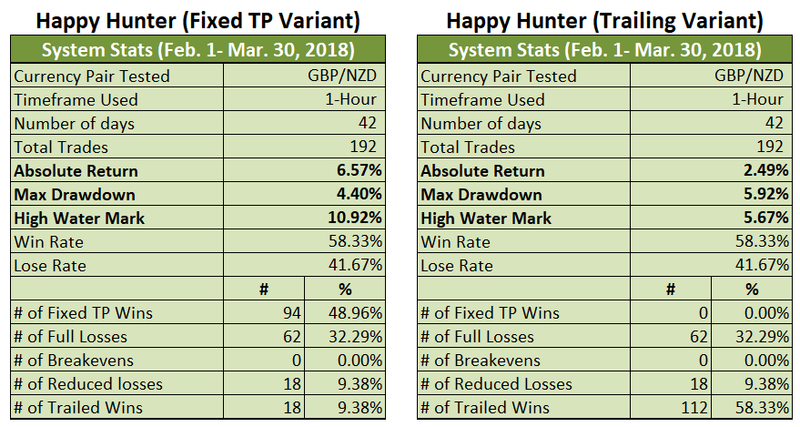 It’s therefore time to take a look at how both Variants of the Happy Hunter fared during the second month of the forward test. And here are the topics we’ll be covering today. If y’all can still recall my March 30 daily update, there were some short trades that were still open back then, and I was worrying about a possible worst-case scenario. Well, that worst-case scenario didn’t play out, which is quite fortunate. Unfortunately, the ideal scenario where all open trades reach TP also didn’t pan out. 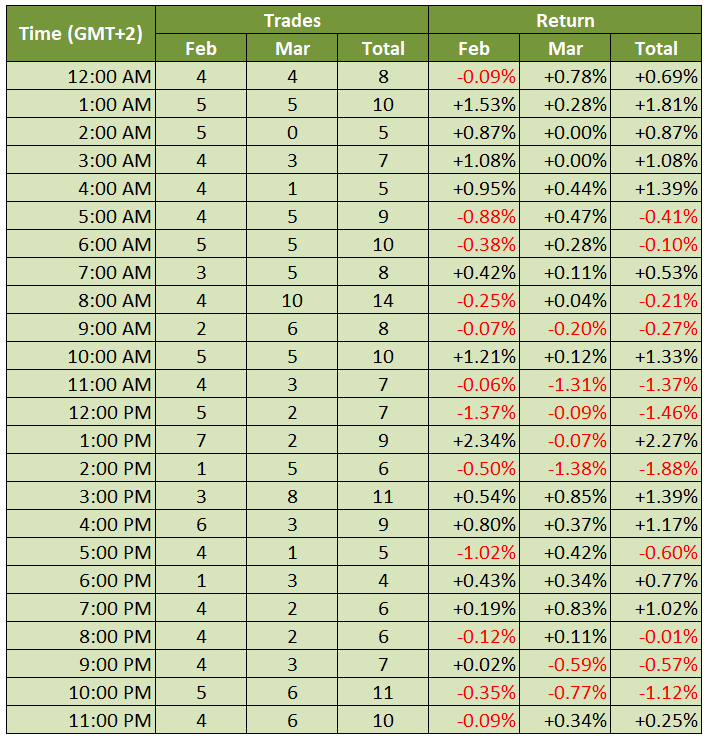 As such, the results of the March 30 daily update ended up being the final results. 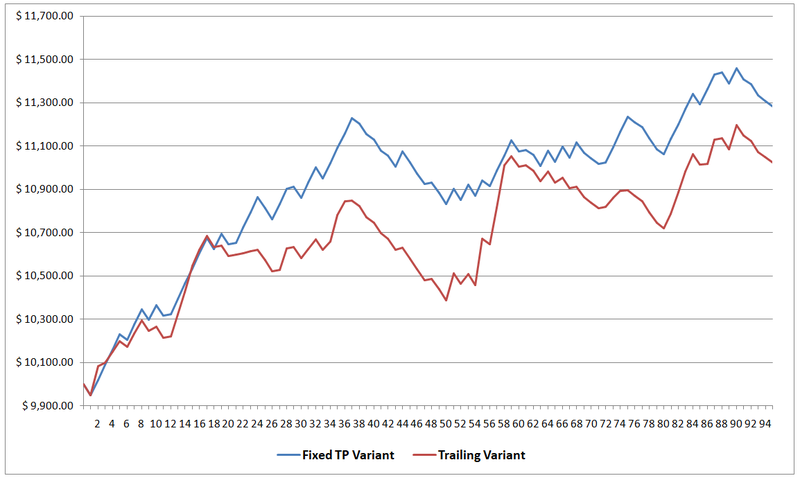 The Fixed TP Variant started out strong and even reached a high water mark of 5.72%. However, it was downhill from there and the Variant closed out the month with 1.37% in gains. The Trailing Variant, meanwhile, ended the month with 0.53% in gains, which is a long way away from the high water mark of 3.58%. And if we compare the results for March with February’s results below, it’s quite clear that the system fared relatively poorly in March. Pretty much every metric in March was inferior: a smaller return, a deeper drawdown, lower high water mark, and lower win rate. 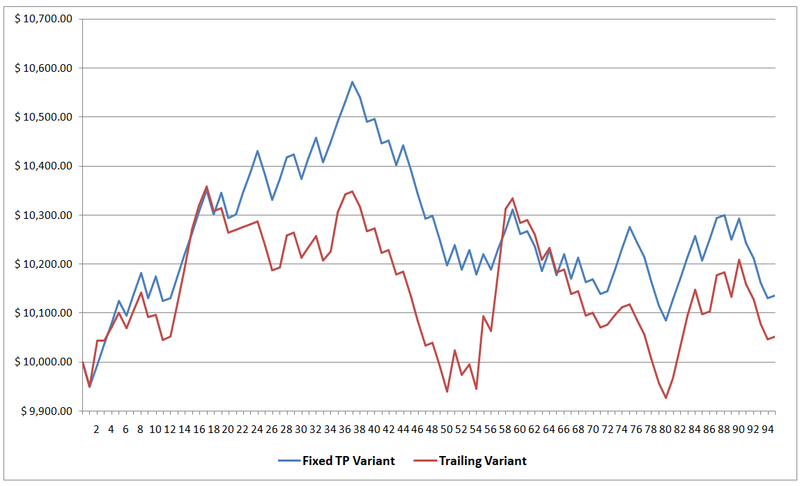 In fact, only the Trailing Variant’s drawdown in February was worse. Since the system fared relatively poorly in March, does that mean that the system should be scrapped? Well, first recall that I had the following goals when I first laid down my plans in My 2018 Trading Resolution. I also had the following bonus goals (some are obvious jokes). Take note that monthly growth targets are not listed in my goals. So while the system did generate inferior returns in March, that alone is not enough to disqualify the system. 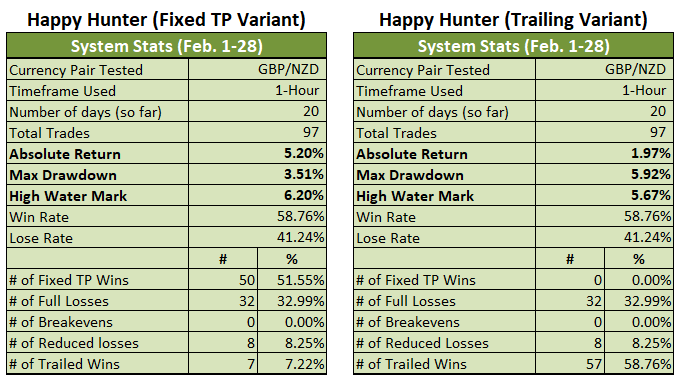 Anyhow, both variants did not come close to exceeding the 20% drawdown threshold, so both variants clear that goal easily enough. 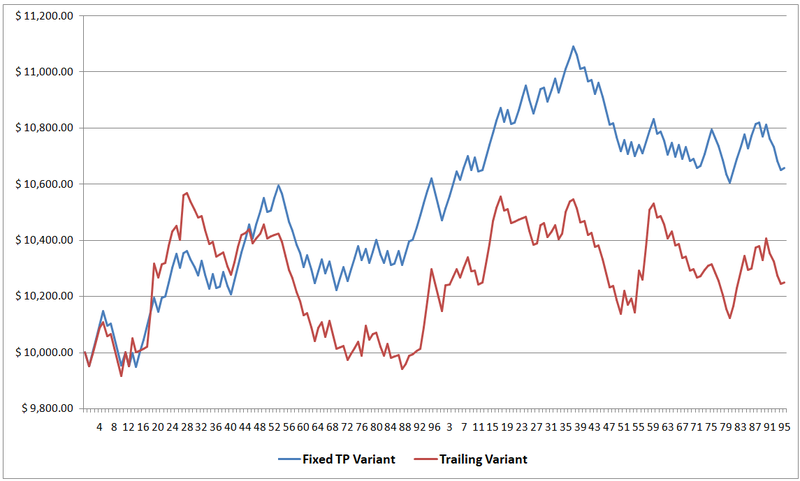 As explained in last month’s evaluation, the goal with regard to the reward-to-risk ratio is not really applicable since the Trailing Variant has no set TP while the Fixed TP Variant has a reward-to-risk ratio that is inherently less than 1:1 because of the relatively large 12-pip spread. Also, both Variants make up for this by meeting the bonus goal of having a win rate above 50%. Moving on, the system opened at least one trade per day in March, so that goal was also easily met. As for my other goals, well, both Variants closed the month with some gains, so both Variants met my goal of not having a losing month. Can’t say the same for the bonus goal of having no losing week, though, since there were two losing weeks in March. Overall, both Variants are meeting my main goals, so I’m happy with that. However, there may still be room for improvement. 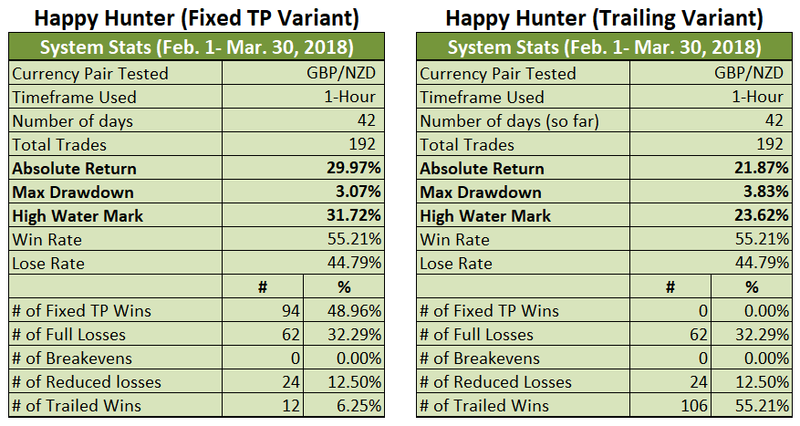 That’s almost 2% in gains missed by the Fixed TP Variant. And to be fair, those trades would have also still been filtered out under the old rules. And as mentioned in some of my earlier updates, I’m working out to see if there’s a set of rules that would allow the system to ride those missed trades without affecting the other trades in any way. 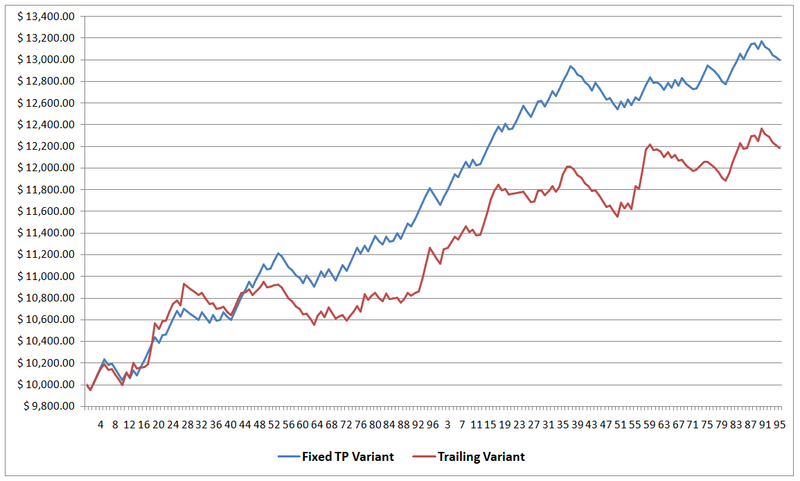 Here’s how both Variants have been performing during the entire forward testing period. Readers WoWtrader and mrie were nice enough to throw some suggestions my way in our recent exchanges. Basically, they suggested that I take a look at the time trades were opened to see if we can use time as a filter. Well, I did just that. 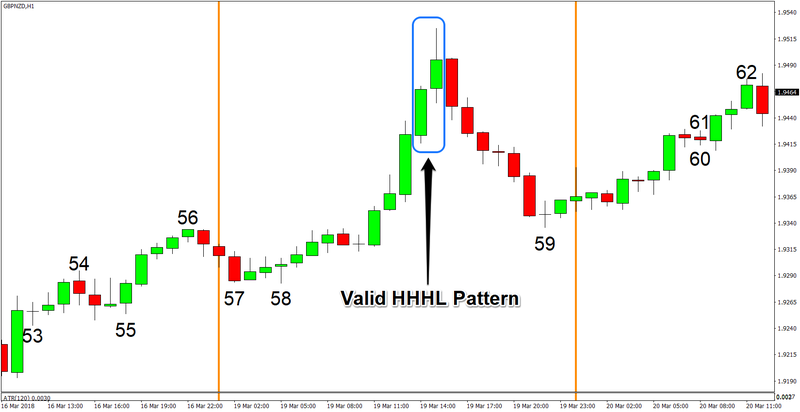 This is just a simple breakdown of trades based on the time the patterns formed and the returns (or losses) generated. Also, the sample size is a bit small, so the results are inconclusive at this point and I probably need to do a more thorough analysis, but there were some rather interesting results. From the looks of it, 10:00 pm seems to be a good time to avoid while 3:00 pm and 4:00 pm are likely to generate winning trades. But again, the results are still inconclusive at this point. But they’re worth watching. While we’re at it, I also broke down the trades, depending on the Entry Type used. This is only for the Fixed TP Variant, by the way. Entry Type 3 has been letting us down so far while Entry Type 2 is a real money maker. Entry Type 1, meanwhile, had had a mixed performance since it generated the bulk of returns back in February but was the main drag to the system’s performance in March. The explanation for this is simple. First, recognize that there was a choppy uptrend in March, as you can see below. 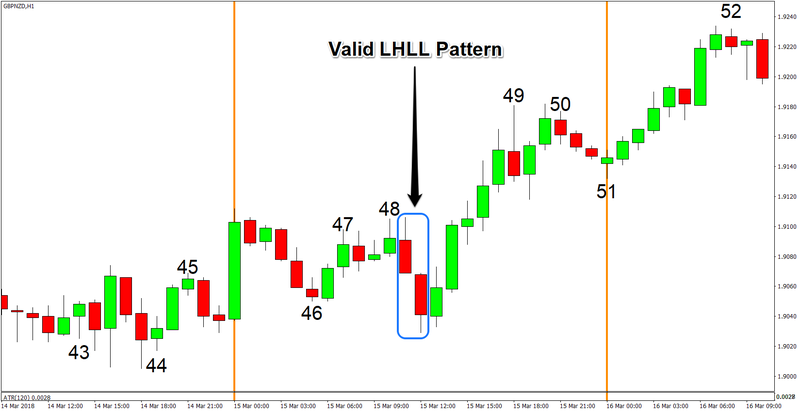 Second, if you look at the trade details, you’ll find that of the 44 Entry Type 1 trades, 22 or half of them were shorts. And of these 22 short trades, 14 or 64% of them ended up being losers, with most ending up with full losses for a total loss of 6.43%. 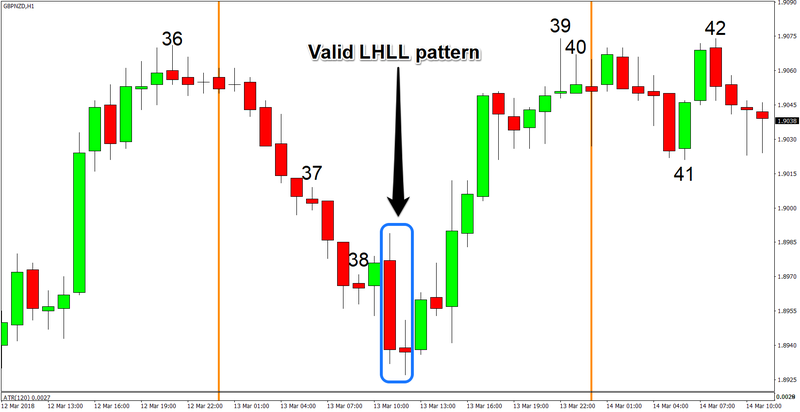 And many of those full losses were incurred when the pair began trading higher. If the uptrend was strong and steady, only a few short orders would have been triggered. 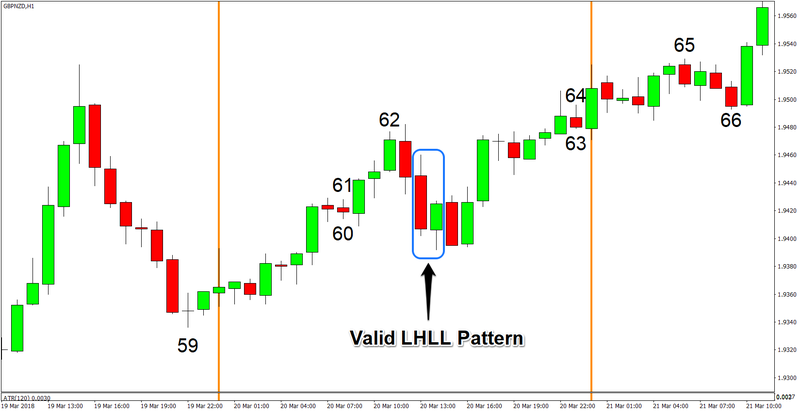 But because of the choppy intraday price action, a lot of sell orders got filled, which then got promptly stopped out. 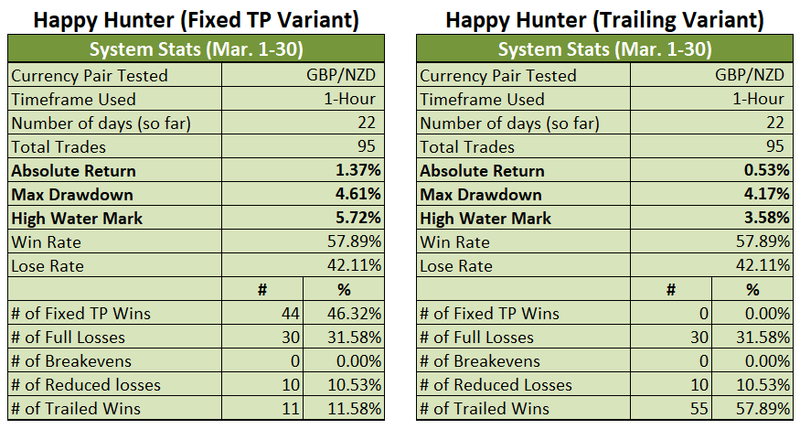 I think I mentioned a few times before that the Happy Hunter’s true enemy is the relatively large 12-pip spread that’s assumed in every trade. 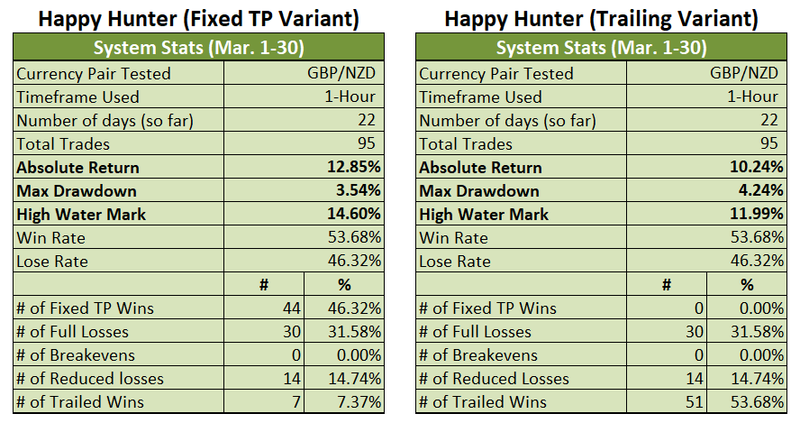 And as a refresher, we use a fixed 12-pip spread because most brokers that have fixed spreads have a 12-pip spread on GBP/NZD. 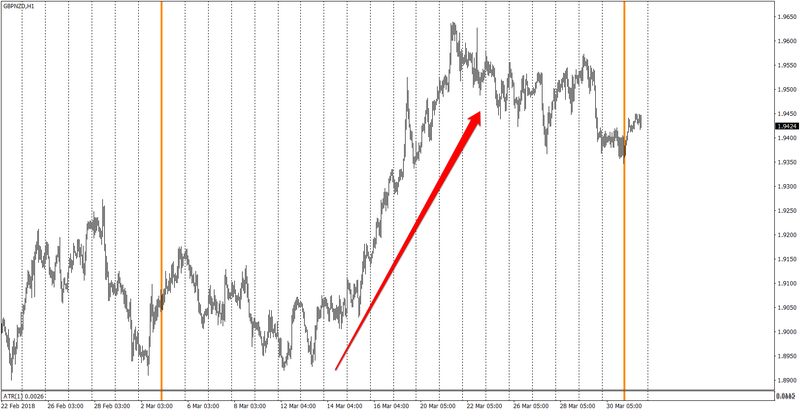 Sure, there are some brokers that offer fixed spreads of only 8 or 9 pips, but where’s the challenge in that? But for, uh, academic purposes, I’m presenting here how both Variants would have fared for the month if we live in a fairy tale, zero-spread environment. Pretty impressive, right? It also probably makes you want to run your own brokerage company, huh? Anyhow, here’s how the system would have fared for the entire forward testing period, assuming once again that we live in a zero-spread environment. Okay, that’s enough fantasy for today. It’s back to the daily updates tomorrow. And as always, I enjoy your feedback. So if you have any questions, or if you just want to say “hi” then don’t be shy and write a comment down below!